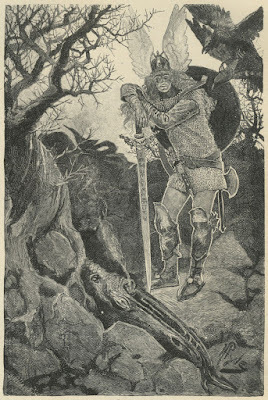 The “matter” was the illustrations for James Baldwin’s retelling of the Siegfried (or Sigurd) legends. 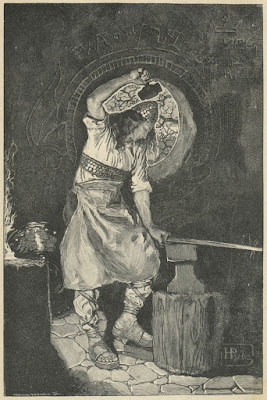 At the time, Pyle - whose interest in Medieval folklore was already well-established - was under an exclusive, one-year contract with Harper & Brothers for his pictures, but as it only extended to periodicals and not to books, he was able to accept the commission. Up to this time the manuscript has been in the hands of the artist, Mr. Howard Pyle, who has been somewhat delayed in making drawings.... The illustrations are now well advanced, however; they are six in number, full-page cuts, and are in our opinion admirably conceived and drawn. Proofs of them will be sent you as they are received from the engravers. 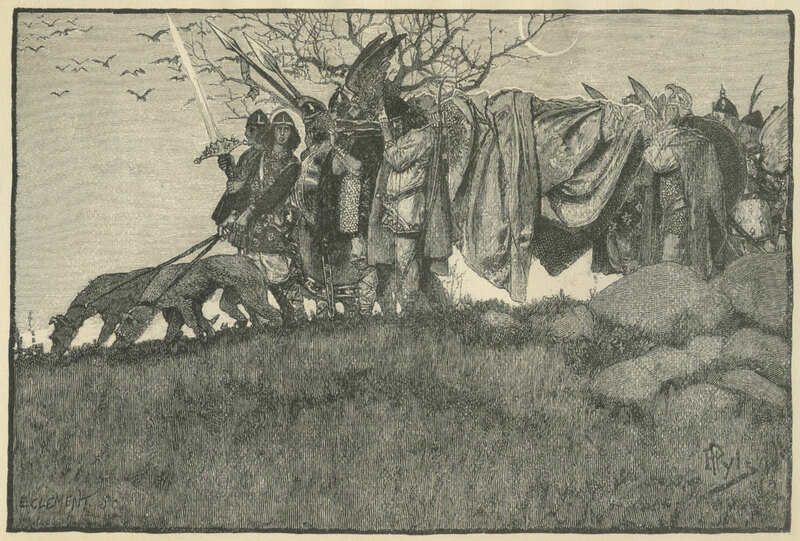 We send you by this post some very rough unmounted photographs of Mr. Howard Pyle’s drawings for Siegfried. 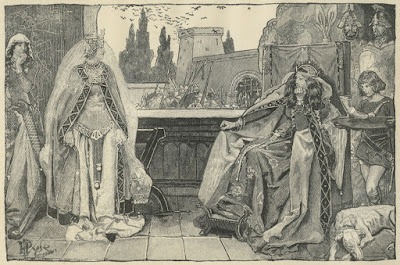 These will give you no idea, to be sure, of the great beauty and force of the pictures themselves; but they only convey the grouping and general composition well enough to show you that we have given the work to one of the best artists for such a subject. Mr. Pyle has been cordially interested in it, and in our opinion has done his part in the true spirit of the text. The dear, delightful people of the Nibelungen come before one bodily, and in such a way that one feels thankful to the artist for his creation of them. The illustrations are full of ideality, and without that apparent assumption of oddness that has, in the eyes of some, spoiled Mr. Pyle’s good work. 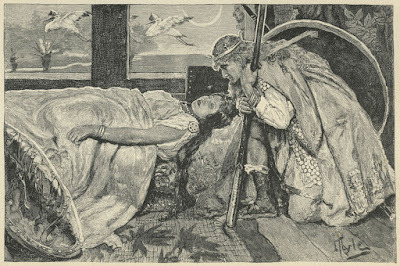 The awakening Brunhild by the kiss of Siegfried, is exquisite. 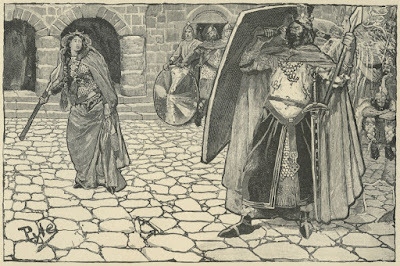 The calm, placid expression of her face, and the wonder that overspreads the knight’s, display a real feeling with the legend, and without which feeling no man should illustrate a book. What Pyle himself thought of the illustrations is not known, but “The Death of Siegfried” (below) is surely one of the best and most “Pylean” things he made thus far in his 6-year-old career. 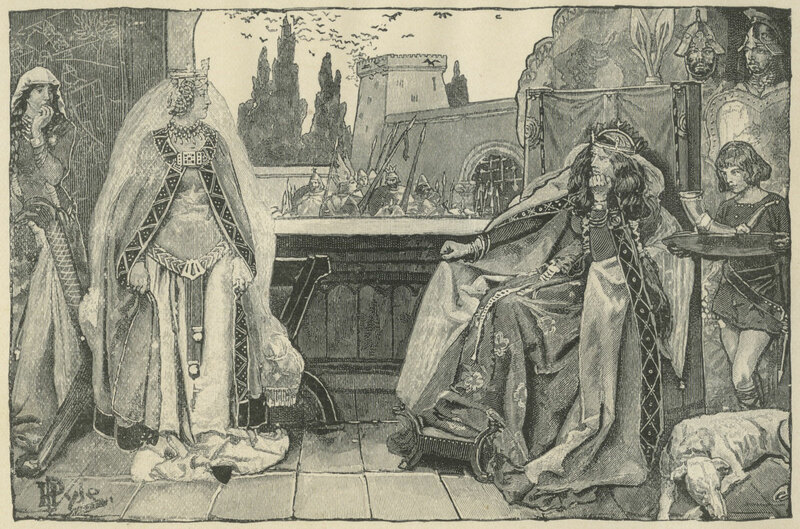 In 1885, four of the set were included in the Grolier Club’s Exhibition of Original Designs for Book Illustration, but afterward they - like most of Pyle’s Scribner work - joined the other two at the publisher’s offices on Broadway near Astor Place, and then to Fifth Avenue between 20th and 21st Streets, where Charles Scribner’s Sons relocated in 1894. Over the years, some of Pyle’s originals found their way out of storage - sold or given away piecemeal - but most remained there until 1915, when The Wilmington Society of the Fine Arts acquired some 68 of them - almost all that were left. The six Siegfried illustrations, however, were not included. Why? Fire Starts in Counting Room and Does $6,000 Damage. A fire originating on the third floor of Scribner Bros.’ publishing house, Nos. 153, 155 and 157 Fifth avenue, at 5 o’clock this morning caused damage amounting to $6,000. Patrolman Jones saw the reflection of the flames and turned in an alarm. The firemen broke into the building and found the blaze had gained headway in the counting room on the third floor and worked through to the fourth floor. The origin of the fire is a mystery. 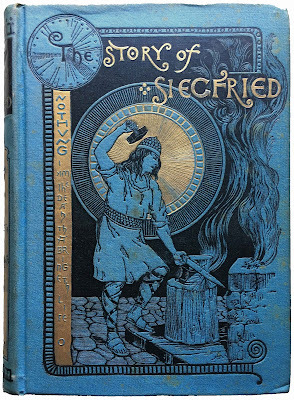 The extent of the “$6,000 damage” is also a mystery, but Scribner’s index-card inventory of artwork (now at the Brandywine River Museum) shows that all six Siegfried pictures and at least one other Pyle oil - not to mention works by his fellow artists, like N. C. Wyeth - were destroyed. Wow, great post. And what a tragedy! 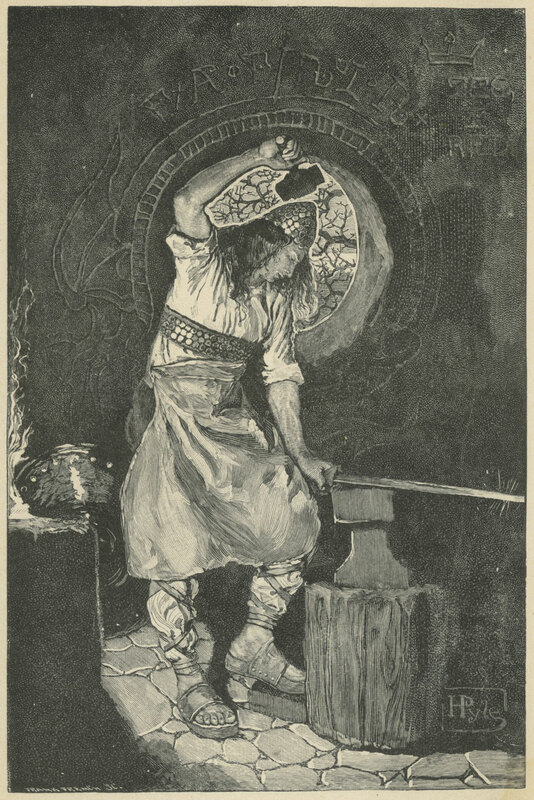 I wonder, given the late july 1908 date of the fire, whether it consumed the art done for the August 1908 issue, particularly Walter Everett and Franklin Booth's masterful pictures for "House of Rimmon." It’s possible - I’ll let you know if I find out. 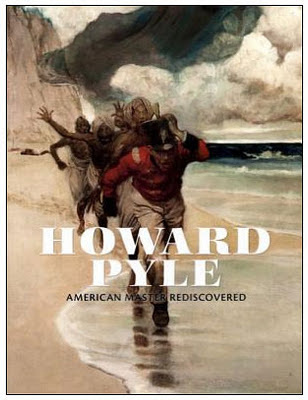 Do you have letters, photographs, books, drawings, sketches, paintings, or any primary materials of or pertaining to Howard Pyle? Would you like to know more about them? By all means, please contact me. Just click on my photo above.